It is quite fascinating that in the year of Brexit there seems to be more entries in English than ever before. Ireland didn't qualify for the final again and next year we will be the only country in the EU with English as our first language. As usual the stage set for the Eurovision is a display of the great advances in technology in video, sound and lighting. 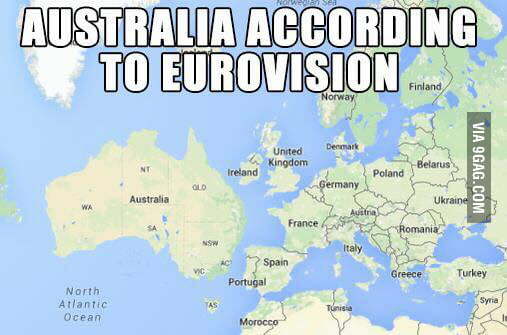 It is also worth noting that Australia has qualified again for this EUROvision contest! Maybe New Zealand next year. I know a few Australians, so I know who I'll be rooting for! I do think the UK song is a better offering than in recent years but I fear Brexit will cast a long shadow over this evening's events. The Eurovision final will be shown live on American TV! The LOGO channel will broadcast the show at 3 pm today. I wonder if Russia might win ? ah yes that bit was over in a flash, Interpol are going to issue an Identikit picture of the offender. The girl from Belgium was good and the Romanian Yodel It was good to raise a smile or two. I thought Lucie Jones was fantastic... I had very high hopes for this very lovely girl representing the UK! Having never seen the Eurovision before, I was impressed at the quality of the staging etc...bit like the X-Factor final. Fear not Joe, the UK is one of the big five, France, Germany, Italy, Spain and the United Kingdom, the main financial contributors to the contest, who are all guaranteed a place in each year's finals. It doesn't help them to win, though!